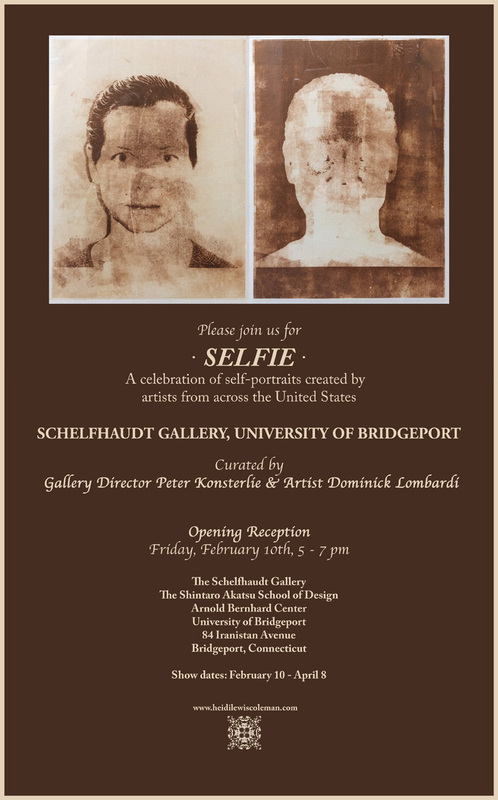 Heidi Lewis Coleman will be exhibiting her monotypes, HEIDI: POSITIVE & NEGATIVE, in SELFIE, a new exhibit opening at The Schelfhaudt Gallery, University of Bridgeport. Please join us on Friday, February 10th from 5:00-7:00pm for a celebration of self-portraits created by artists from around the country. The curators are Gallery Director Peter Konsterlie and Artist Dominick Lombardi. The Schelfhaudt Gallery is located in the Shintaro Akatsu School of Design at University of Bridgeport, Arnold Bernhard Center, 84 Iranistan Avenue, Bridgeport, CT. Show dates: February 10th - April 8th.